A mandate to “Bijli, sadak, pani” government! There has been a crescendo of cheering for Bihar mandate this time. And the reason for it is inclined more towards the debacle of BJP-led NDA than uprising of the Grand Alliance. Now the bigger question is why NDA failed to make a mark in Bihar. Is it the waning wave of Narendra Modi or use of flawed strategy? Or should I ask why Grand Alliance turned out to be a grand in Bihar? Speculations are abounding. Everybody aspires “Bijli, sadak, pani” and this is what Mr Nitish Kumar worked for throughout his last tenure. 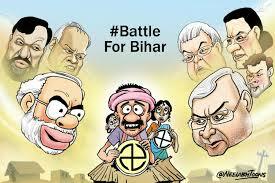 He metamorphosed the reputation of Bihar from “Bimaru” state to a better state. And he is now reaping what he had sown. He has provided rural electrification, improved the condition of roads and provided water to the proletariat. If we look at the raw data, Bihar has become a leader from a laggard in terms of CAGR, 10.6% rise from 2005-06 to 2014-15, which is the highest among major states. It is not the only statistic; the state has topped the chart in job-growth as well with 8.1% annual growth from 2005-06 to 2012-13 in industrial jobs. I assume this is the prelude of being a developed state, although there is long way to go. But this cannot renege the fact that backwardness still prevails in the mind-sets of people who are staunch advocates of caste and religion. It can be corroborated by the fact that RJD secured more votes than JDU, which shows the loyalty of Lalu Prasad Yadav’s supporters despite knowing that he is a prime accuse in Fodder scam and still people have bestowed credits upon Mr Yadav than Mr Kumar. This is quite appalling. In every nook and corner of the country, people have been creating a clamor that Modi wave is waning which I don’t think so. I am a student of facts. Believe me when I claim such a statement. BJP as a single party increased its vote share this time from 16.46% in 2010 to 24.8% in 2015 whereas RJD and JDU have plummeted from 18.84% and 22.61% respectively in 2010 to 18.5% and 16.7% respectively, although the number of voters have also gone up this time. It is simply because of the grand alliance why they managed to keep BJP at bay. The reasons why NDA lost are pretty evident. One of the reasons is they have overexposed Mr Modi. One cannot win elections based on one face every time, I mean he is the Prime Minister of the country but he was not going to administer the state had they won the mandate. They should have portrayed some local strong face. Another reason could be they could not control their accomplices for creating communal environment. Radical form of activities, such as banning beef and lynching a man for the suspect of consuming beef, do not work. This is simply ludicrous. We live in Union of India and unlike Pakistan, it is a nation for all religion, one cannot impose one’s dietary habits on others. Therefore, the elites of BJP could have shown some earnestness towards discipline of their allies. It is high time for BJP to introspect and change their tactics if they do not want to face the same fate in the upcoming Assam and other elections. I strive to be a good human being.